FAYETTEVILLE, Ark. – Human norovirus is the number one cause of foodborne illness in the United States, accounting for 58 percent of cases. The virus is also known as gastroenteritis and commonly called the stomach flu, and there is currently no treatment available for those infected. However, Sabastine Arthur, graduate student in cell and molecular biology, wants to change that. Human norovirus is difficult to study because it cannot be reproducibly cultured in a lab. The only way to learn more about the virus is through human volunteer studies, which are cost prohibitive and complicated to conduct, or by identifying other viruses with similar characteristics that mimic those of human norovirus. Arthur has spent nearly two years closely examining the profiles of Tulane virus and porcine sapovirus with the aim of showing they are apt surrogates for the study of human norovirus. If Arthur is able to successfully establish that these viruses are the most suitable surrogates to use in this endeavor, the implications could be significant for other researchers in the field. Scientists would be able to begin exploring possible control strategies for preventing contamination and infection. Relatively little research has been conducted on Tulane virus and porcine sapovirus in the United States. Arthur is playing a critical role in learning more about the viruses by adding literature and data to the field and by replicating existing research to establish its validity. However, that process has not come without its challenges. Because Arthur had never studied a virus before delving into this project, he has relied on assistance from researchers at the Centers for Disease Control and Prevention and Ohio State University, who are among the few in the country examining the Tulane virus and porcine sapovirus. Arthur acknowledged individuals from both organizations have been helpful in keeping him on the right path and ensuring he follows proper procedures. Perhaps the most significant support Arthur has received throughout the process, however, has been from his advisor Kristen Gibson, assistant professor of molecular food safety and microbiology with the UA System Division of Agriculture and the Dale Bumpers College of Agricultural, Food and Life Science’s Food Science Department. “Dr. Gibson is ever-ready to listen and to allow me to do what I think is right, and when I am wrong she directs me to the right course,” he said. Arthur had an academic article published in 2014 and anticipates two more going to print before he completes his degree. Additionally, his research earned him first prize in the food science category at the 2014 “From Abstract to Contract: Graduate Student Research Poster Competition” and first prize at the 2014 Arkansas Association for Food Protection Educational Conference. His overall academic character resulted in his being nominated for the Dale Bumpers College of Agricultural, Food and Life Sciences distinguished Master of Science scholar in 2015. Gibson attributes her student’s success to his work ethic and the enthusiasm he shows for research. “He is highly motivated and very passionate about what he does, which is why he has been able to accomplish so much in a short period of time,” she said. 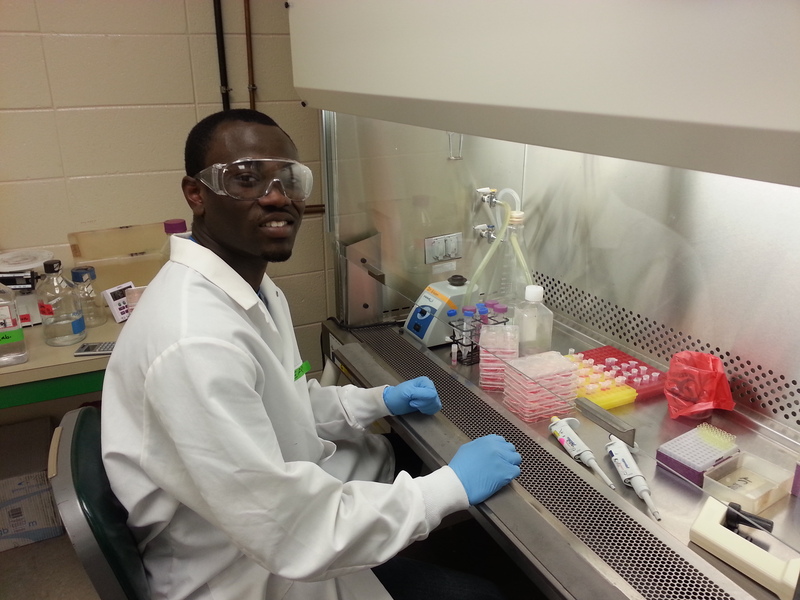 The Ghana native came to the University of Arkansas in 2013, after completing a bachelor’s degree at the University of Cape Coast in his home country. He is on track to finish his master’s degree in May 2015.